CAPE CANAVERAL, Fla— KENNEDY SPACE CENTER – Looking for something new and unique to do this holiday season? 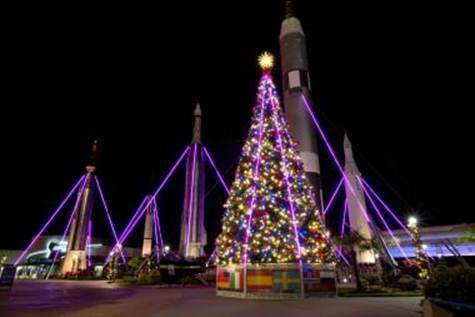 The holidays at Kennedy Space Center Visitor Complex are going high-tech with a first-of-its-kind 3D show “projection mapped” onto a rocket, and a laser and light show so spectacular, astronauts aboard the International Space Station (ISS) should be able to see the beam. An Atlas V rocket blasts off from Cape Canaveral. Kennedy Space Center Visitor Complex guests can enjoy viewing the thrilling and historic launch of a massive United Launch Alliance Atlas V rocket carrying the Mars Atmosphere and Volatile EvoultioN (MAVEN) orbiter on Monday, Nov. 18. The rocket will lift off from Launch Complex 41 at Cape Canaveral Air Force Station with a launch window from 1:28 p.m. to 3:28 p.m. EST. Launch viewing is included in regular Kennedy Space Center Visitor Complex admission and features live mission control commentary. Visitor Complex guests may view the launch from the Apollo/Saturn V Center, the closest possible public viewing area, or specially designated areas at the Visitor Complex. Guests may bring blankets and compact “umbrella-style” folding chairs that are carried in shoulder bags. Space will be available on a first come, first serve basis. The MAVEN mission will explore the Red Planet’s upper atmosphere, ionosphere and interactions with the sun and solar wind. Scientists will use MAVEN data to determine the role that loss of vital compounds from the atmosphere to space has played through time. This data will provide insight into the history of Mars’ atmosphere and climate, and whether the planet was ever capable of supporting life. MAVEN is the first mission dedicated to measuring the upper atmosphere of the planet. The Visitor Complex will celebrate the MAVEN launch with four days of special launch-related activities, including a presentation on Sunday, Nov. 17 by Bill Nye of the Emmy award-winning TV show, “Bill Nye the Science Guy®.” Nye will speak to guests, preparing them for the launch of the MAVEN spacecraft. Nye is the chief executive officer of The Planetary Society, the world’s largest space interest group, as well as a scientist, former Boeing engineer, stand-up comedian, author, inventor and man on a mission: to help foster a scientifically literate society. He is the host of three currently running TV shows including “The 100 Greatest Discoveries” on the Science Channel, “The Eyes of Nye” on PBS and “Stuff Happens” on Planet Green. All presentations and special displays and exhibits are included in regular admission to the Visitor Complex. Launch date and time are subject to change. For more information or to purchase tickets, call 877-313-2610 and visit www.KennedySpaceCenter.com. Kennedy Space Center Visitor Complex brings to life the epic story of the U.S. space program, offering a full day or more of fun and educational activities, including the new Angry Birds™ Space Encounter, Shuttle Launch Experience, 3D IMAX® space films, Astronaut Encounter, Exploration Space®: Explorers Wanted and many other interactive exhibits. The new $100 million home for Space Shuttle AtlantisSM opened June 29, 2013. Admission also includes the U.S. Astronaut Hall of Fame®, featuring historic spacecraft and the world’s largest collection of personal astronaut memorabilia, which opens daily at noon and closing times vary by season. Only 45 minutes from Orlando, Fla., Kennedy Space Center Visitor Complex opens daily at 9 a.m. with closing times varying by season. Admission is $50 + tax for adults and $40 + tax for children ages 3-11. The Kennedy Space Center Visitor Complex offers annual passes starting at $75 + tax for adults and $60 + tax for children ages 3-11. For more information, call 877-313-2610 or visit http://www.KennedySpaceCenter.com. Getting nose-to-nose with the real space-flown orbiter Atlantis is just one part of the experience to be had at new $100 million Space Shuttle AtlantisSM attraction at Kennedy Space Center Visitor Complex. The immersive experience invites guests to “be the astronaut” with never-before-seen, technologically sophisticated multimedia presentations and more than 60 interactive, touch-screen experiences and high-tech simulators. 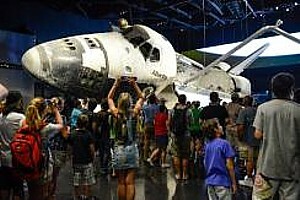 In celebration of the new $100 million Space Shuttle AtlantisSM attraction that opened June 29, Kennedy Space Center Visitor Complex guests who assemble their own “Atlantis Crew” can save up to 20 percent off regular admission. The larger the crew, the greater the savings. For a party of two, admission is $90 plus tax, or 10 percent off regular admission. A party of three will receive 15 percent off regular admission, or $127.50 plus tax. A party of four will pay only $160 plus tax, or 20 percent off regular admission. Tickets must be purchased by Sept. 2. For savings on groups of five or more, call 866-768-2167. Space Shuttle Atlantis is the world’s most comprehensive and interactive attraction devoted to NASA’s 30-year Space Shuttle Program. Of the three space-flown orbiters distributed by NASA to science centers and museums throughout the country, only Atlantis is the focal point of a $100 million, 90,000-square-foot attraction containing four multimedia and cinematic productions and more than 60 interactive experiences that invite guests to “be the astronaut” and to celebrate the people, passion and patriotism behind the shuttle program. Space Shuttle Atlantis also includes Shuttle Launch Experience, an incredible simulated journey of vertically launching into space and orbiting Earth aboard the space shuttle. Only at Space Shuttle Atlantis can guests come literally nose-to-nose with an actual space shuttle orbiter that flew in space 33 times and still bears the scars, scorch marks and space dust of its last mission. Only at Space Shuttle Atlantis can guests have a nearly 360-degree view of Atlantis as only astronauts have seen it before, tilted on its side at a 43.21-degree angle, seeming to float in space with its payload bay doors open and its robotic arm extended, as if it has just undocked from the International Space Station (ISS). And, only at Kennedy Space Center can guests say they saw a shuttle at the home of human spaceflight, where all 135 space shuttle missions from 1981 to 2011 were launched and processed. Located only 45 minutes from Orlando, Kennedy Space Center Visitor Complex features many attractions and year-round interactive programs, including meeting real astronauts. The standard bus tour, included with admission, explores the history of the Apollo moon and space shuttle programs with panoramic views of Kennedy Space Center, the Vehicle Assembly Building’s (VAB) exterior and a stop at the Apollo/Saturn V Center, where visitors see an authentic 363-foot Saturn V moon rocket and relive the historic Apollo missions that saw man land on the moon. Other Kennedy Space Center Visitor Complex attractions and activities include Angry Birds Space™ Encounter, Astronaut Training Experience ® (ATX®), Rocket Garden, two IMAX® theaters, Astronaut Encounter, Lunch With an Astronaut, U.S. Astronaut Hall of Fame® and Exploration Space: Explorers Wanted. Visitors also can share mankind’s greatest achievements and future of the space program with the entire family and receive rare access to areas of Kennedy Space Center that have been off limits to the public for decades. The KSC Up-Close Tour Series includes tours of the VAB, Launch Control Center (LCC), and Launch Pad. All Up-Close Tours are $25 per adult and $19 per child (ages 3-11) plus tax, in addition to admission. For more information on Kennedy Space Center Complex, visit www.KennedySpaceCenter.com. 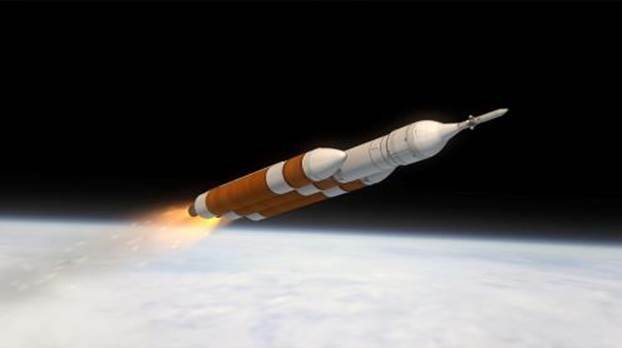 Delta 4 Rocket Launch. 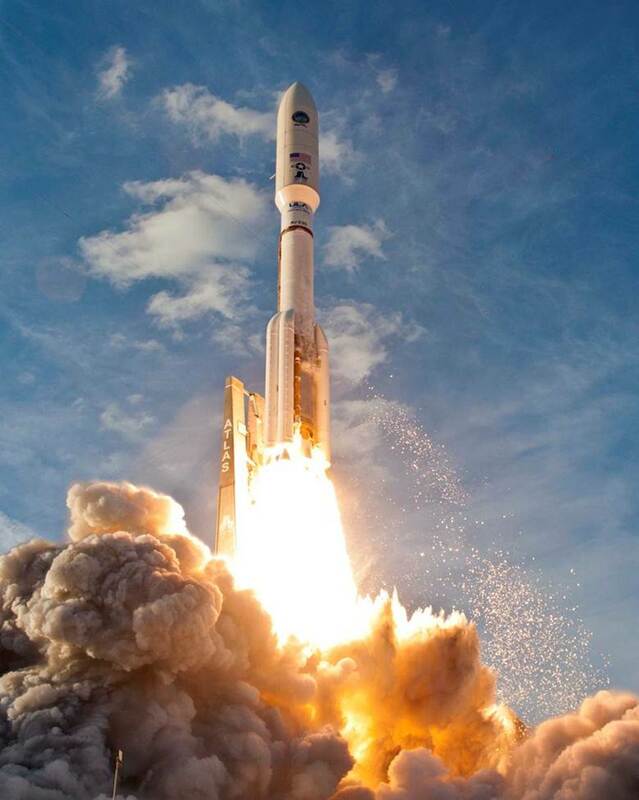 Visitors to Kennedy Space Center will to able to watch the launch on August 7. Kennedy Space Center Visitor Complex guests can enjoy viewing a dramatic nighttime launch when a United Launch Alliance Delta 4 rocket lifts off from SLC-37B at the Cape Canaveral Air Force Station on Wednesday, Aug. 7. The launch window is from 8:29 p.m. to 9:18 p.m. Viewing the launch from the Visitor Complex is included in regular admission and features live mission control commentary. Guests are encouraged to bring folding chairs to the viewing area. Leading up to the opening of the launch window, guests may meet the first space shuttle Atlantis commander, Karol “Bo” Bobko, at the new Space Shuttle Atlantis attraction from 6 p.m. to 8 p.m. 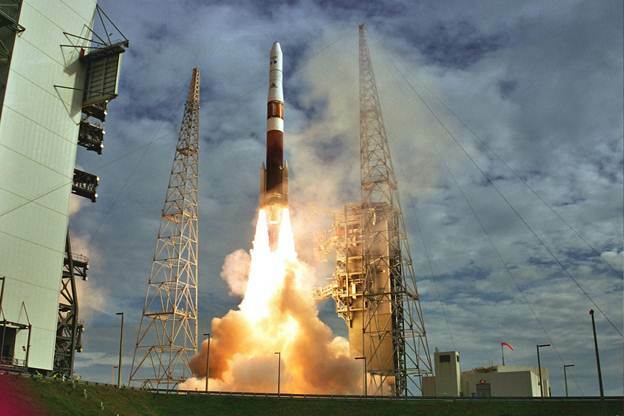 The 200-foot-tall Delta 4 rocket will launch the sixth Wideband Global SATCOM spacecraft. Built by Boeing, the geostationary communications spacecraft will serve U.S. military forces by providing enhanced communications capabilities for the next decade and beyond. The rocket will fly in the Medium+ (5,4) configuration with four solid rocket boosters, enabling the rocket to lift up to 14,475 pounds to orbit. Watch as 50 college teams from across the globe gather at Kennedy Space Center Visitor Complex, May 20-24, to compete in NASA’s fourth annual Lunabotics Mining Competition, a university-level competition designed to engage and retain students in science, technology, engineering and mathematics (STEM). Lunabotics Mining competition is a NASA Human Exploration and Operations Mission Directorate program that challenges teams to design and build remote controlled or autonomous robots that can excavate simulated lunar dirt. Eighty-one judges and hundreds of spectators will be present to watch the teams’ designs, known as lunabots, go head-to-head to determine whose machine can collect and deposit the most simulated lunar dust within a specific amount of time. The competition provides an opportunity for student engineers to develop innovative ideas and solutions that could potentially be applied to future NASA missions. Viewing opportunities of the competition and practice sessions will be available daily from designated viewing areas, which include the official viewing tent, LunArenas, and LunaPits in the Rocket Garden and the Show Pit in NASA Central. Competition viewing opportunities are included in regular Visitor Complex admission. Kennedy Space Center Visitor Complex guests can also participate in NASA’s STEM College Recruitment Fair on Friday, May 24 from 1– 4 p.m. The fair is for high school sophomores, juniors and seniors interested in STEM education opportunities available at top colleges and universities across the nation. For more information on the 2013 Lunabotics Mining Competition or to purchase tickets, call 877-313-2610 and visit www.KennedySpacCenter.com or www.NASA.gov/Lunabotics. In celebration of the June 29 opening of Space Shuttle AtlantisSM, the new $100-million educational attraction at Kennedy Space Center Visitor Complex, the summer camp is themed “Atlantis: Celebrate the Journey.” Campers will learn firsthand about the engineering marvel of the space shuttle. Kennedy Space Center offers a week-long summer day camp experience that educates, entertains and engages children ages 8 to 14, from mid-June to the beginning of August. This year, Camp KSC features two new, interactive attractions that will help launch kids into a galaxy of fun as they pursue science, technology, engineering and math (STEM) through exciting educational activities. In celebration of the June 29 opening of Space Shuttle AtlantisSM, the new $100-million educational attraction at Kennedy Space Center Visitor Complex, the camp is themed “Atlantis: Celebrate the Journey.” Campers will learn firsthand about the engineering marvel of the space shuttle through a look inside the new attraction, which will tell the incredible story of NASA’s 30-year Space Shuttle Program through a host of multimedia presentations and more than 60 interactive exhibits and high-tech simulators. Campers visiting June 10 through June 28 will receive an exclusive sneak peek inside of the attraction before it opens to the public. · Engage in interactive, hands on STEM activities that surround the science performed during Atlantis’ historic missions. · Participate in a simulated space shuttle mission that demonstrates the teamwork and ingenuity of NASA engineers, scientists and astronauts. During the mission, campers may deploy a satellite, dock and transfer supplies to the International Space Station or perform scientific experiments while in simulated orbit. · Learn astronaut training, including simulators and virtual skills. Students will hear real-life experiences from a space shuttle astronaut and learn about the risks and rewards of space flight. · Work as team to build, test and compete against other teams in the Angry Birds™ Challenge. 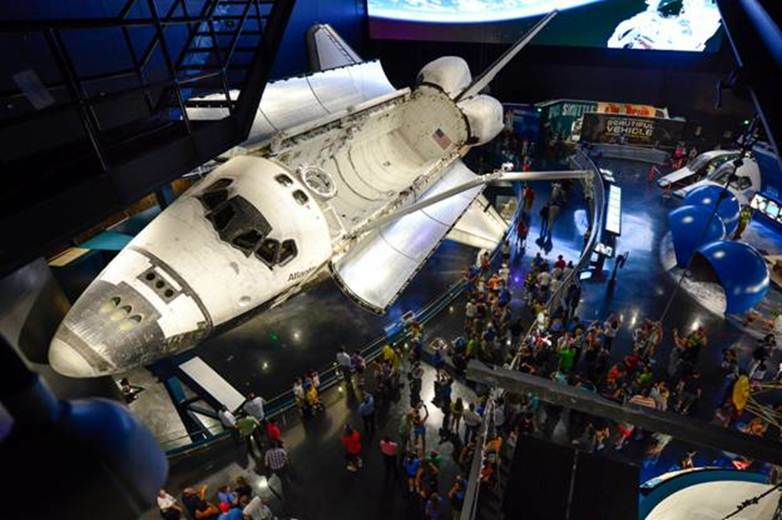 · Visit Kennedy Space Center Visitor Complex, see a space shuttle launch pad and more. In addition, campers will experience the new Angry Birds™ Space Encounter, which opened at Kennedy Space Center Visitor Complex in March. As the first comprehensive, interactive Angry Birds attraction in the United States designed for people of all ages, it incorporates concepts of human space exploration and physics. The attraction was developed in partnership with Rovio Entertainment, which had worked with NASA on the popular Angry Birds Space game. The Camp KSC program is designed for children entering 2nd through 9th grades and runs Monday through Friday, 9 a.m. to 3:30 p.m., with early drop-off offered at 7:30 a.m. for an extra fee. Camp instructors are specially trained educators. All campers receive a Camp KSC certificate, an Annual Pass for free admission to Kennedy Space Center Visitor Complex and a specially designed Atlantis-themed Camp KSC shirt. Lunch and snacks are provided. The camp runs during the weeks of June 10-14, June 17-21, June 24-28, July 1-5, July 8-12, July 15-19, July 22-26, July 29-Aug. 2 and Aug. 5-9. Camp Kennedy Space Center is located at the U.S. Astronaut Hall of Fame’s® educational facility, just off US 1 near the west entrance to Kennedy Space Center Visitor Complex. Tuition is $295 per week plus tax, paid in advance. For more information or to book a reservation, call 877-313-2610. Kennedy Space Center Visitor Complex brings to life the epic story of the U.S. space program, offering a full day or more of fun and educational activities, including the Kennedy Space Center Tour featuring the Saturn V Center with an actual Saturn V moon rocket, the new Angry Birds™ Space Encounter, Shuttle Launch Experience, 3D IMAX® space films, Astronaut Encounter, Exploration Space: Explorers Wanted and many other interactive exhibits. The new $100 million home for Space Shuttle AtlantisSM opens June 29, 2013. Admission also includes the U.S. Astronaut Hall of Fame®, featuring historic spacecraft and the world’s largest collection of personal astronaut memorabilia, which opens daily at noon and closing times vary by season. Only 45 minutes from Orlando, Fla., Kennedy Space Center Visitor Complex opens daily at 9 a.m. with closing times varying by season. Admission is $50 + tax for adults and $40 + tax for children ages 3-11. The Kennedy Space Center Visitor Complex Commander’s Club Annual Pass is $63 + tax for adults and $53 + tax for children ages 3-11. 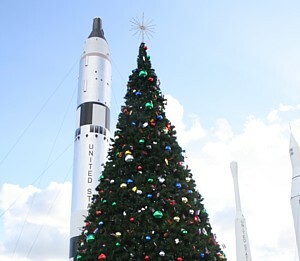 For more information, call 877-313-2610 or visit www.KennedySpaceCenter.com. Kennedy Space Center Visitor Complex is operated by Delaware North Companies Parks & Resorts at KSC, Inc., a division of Delaware North Companies, one of the world’s leading hospitality and food service providers. Kennedy Space Center Visitor Complex is not funded through tax dollars or appropriated funds. 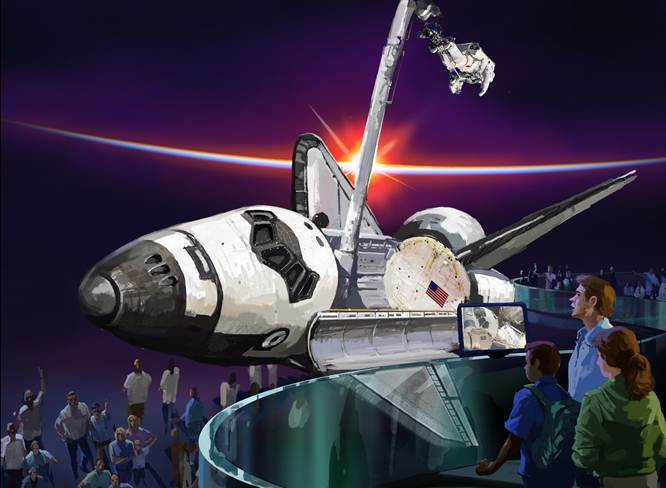 The revenue generated by ticket, food and merchandise sales support the operation, maintenance and development of the Visitor Complex, including the new Space Shuttle Atlantis.